Any trip to Ventura should always include a trip to the Harbor. There are a lot of restaurants to choose from, so over the next few months EatMeCalifornia will try to get you a good idea of where to go for the best views and the best food. We’ve already given you the Seafood Broiler. Now it’s time to spend some time at Margarita Villa. Margarita Villa is on the top deck, right above the carousel. They have one of the best views of the Harbor and a great deck to eat and enjoy the view. Like most of the restaurants in the harbor, it has the hand painted walls, lots of windows and a full bar. There are a few TVs to catch a game and they have a live band a few nights a week. On this particular night there was a band and for the most part they played cover songs. All I remember of the talent is a horrible rendition of Johnny Be Good. I hoped the food would be better then the music, because I think I saw Chuck Berry crouched in a corner, ready to hit the lead singer with his guitar. We’ll start it off with a necessary ingredient of any Mexican restaurant meal: the chips and salsa. They have a decent salsa. It has big chunks of tomato, cilantro, and onion and has a good heat that sneaks up on ya as you keep dippin’. Brian ordered some tortilla soup and he can tell you more about that, from the looks of it though it was full of chicken. I will also let him fill you in on his Chili Colorado. I went with the California burrito which is absolutely huge. 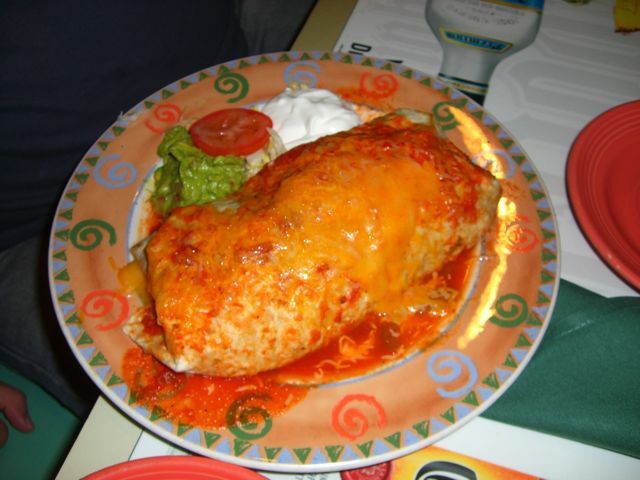 The California burrito is a wet burrito, which is a terminology that I absolutely hate. Having wet food just doesn’t sound appetizing. However, this wet burrito is pretty damn tasty. It is loaded with marinated chicken, they use a great cheddar cheese, and the jalapenos were fresh and had a nice tang. The tortilla was fresh and the guacamole was excellent. Even the sour cream, though it may not be made in house, is excellent on this burrito. I actually had issues eating the entire thing and had to stop with about 4 bites left because my stomach sent up the white flag. 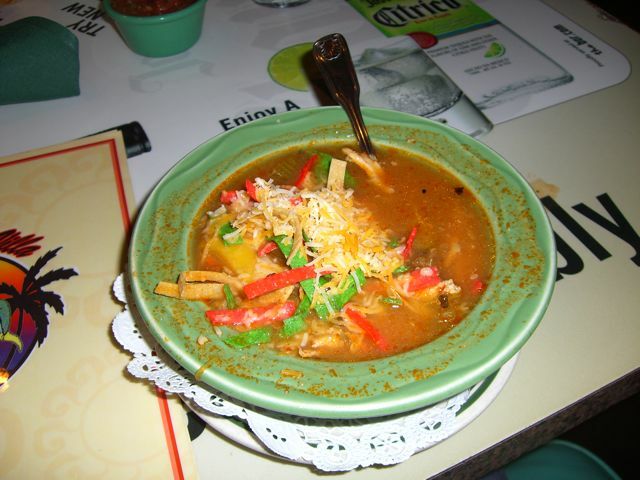 The Tortilla soup was pretty good and it really did have huge pieces of chicken in it. It was pretty standard stuff though and slightly underseasoned. I was glad that I ordered it because I was starving, but if I was of normal hunger, I would probably pass it by. 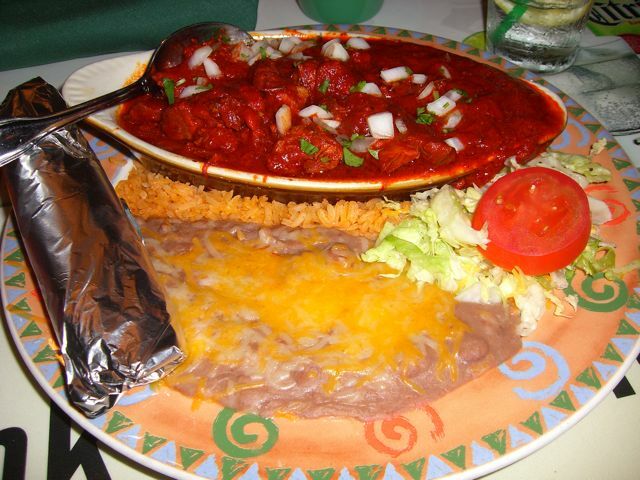 As you can see, the presentation was a little on the simple side, but then again, this is mexican food we’re talking about here. The chile colorado was a little disappointing. First of all, they didn’t have a big enough plate to put it on. The boat that had the main portion of the dish was overflowing with the colorado sauce. Usually i like to be able to see the pork, as opposed to deep sea diving for it. Also, as you can see in the photo, they had nowhere to put the rice. It was crammed in around the dish on top and there was a little more hidden under the “salad.” The beans and rice were tasty, but the ratio of rice to beans was a little off. As far as the pork was concerned, it was tender and juicy. The sauce was underseasoned, but not terribly so. The best part of the dish was the tortillas. They were soft and delicious. Maybe next time I’ll try their fajitas, that way I can set the proportions. There is only one major issue with Margarita Villa. The service was horrible. You definitely end up doing a great impression of Jimmy Buffet and may actually be able to waste away in Margarita Villa. Our waitress would just disappear for so long that when we finally got the check I felt like it was the next night. Thank jeebus that burrito was so big, or I would have been hungry again. I felt like Gunga Din begging for water that never showed up. You spend more time waiting for stuff then eating stuff. You’re definitely going to want to set aside some time if you hit this spot. If you plan on drinking a lot then the wait might not be so bad. If you’re sober though, you’re better off ordering, then going fishing, then asking for a drink then going scuba diving. After that you can ask for your check, but you should probably go to the beach for a little while so it’ll be there when you get back. Also watch out for Chuck Berry he may still be angry.